Despite the availability of different pastries available in Vancouver, I often go for the ol' standby - Chinese bakeries. Yah, I know, there is generally very little refinement found in a BBQ Pork Bun or a Cream Bun (think what you want about that one). 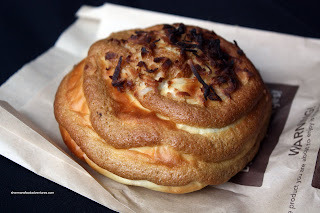 Furthermore, their attempts at European pastries can be just downright laughable. However, due to my upbringing, I am biased. Nothing like a Pineapple BBQ Pork Bun as a snack. I'd take that over a twice-baked almond croissant any day. Now consider my reaction to the latest addition to the pastry scene in Vancouver... Bonchaz out on Hastings claims to be a pastry that is a little bit Asian and a whole lot of Mexican. 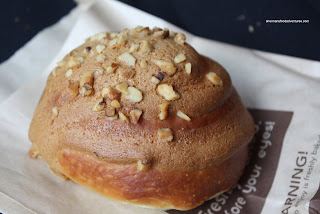 Wait a minute, isn't there a "Mexican Bun" at Chinese Bakeries? Yah, and they look and taste very similar to Pineapple Buns (there is no pineapple in them). It appears that the inspiration for these Mexican buns might originate from an actual Mexican pastry. Now in a twist, we have a reverse Asian fusion of sorts with Bonchaz. Being a bit early arriving into Downtown prior to attending the grand opening of Preston's, I decided to do a pit stop at Bonchaz. Since I was going to meet up with Kim and Mijune later, I decided to get a variety of flavours to share. However, I somehow missed the Chocolate Truffle. Due to the time sensitivity of the product, I had to eat one right away. These are not quite the same eaten cold. I decided to try the Original with sea salt. Honestly, it was a "meh" experience for me. I did like the soft, airy pastry. It's akin to a croissant without the fattiness. Flavourwise, it was bland. However, and this is a big however, once I got to try the Banana Walnut, my opinion changed dramatically. The darn thing was very flavourful; yet not necessarily in an overly sweet manner. Rather, it was aromatic from the bananas and walnuts. 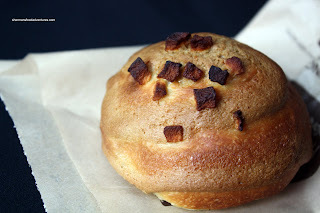 Combined with the soft pastry, I wanted to eat more of it. Now, with that being said, the Apple Cinnamon and Matcha Green Tea were "alright". I thought the apple cinnamon was quite standard with an apple pie type of thing going on. While the green tea didn't offer up anything to make it memorable. In fact, it was a bit bland. I must point out that I tried the other 3 flavours at Michi. They were nice enough to reheat them for us. 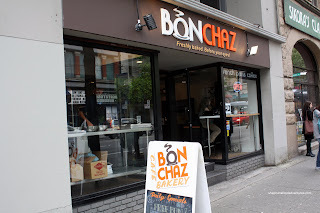 For me, Bonchaz is alright; but when push comes to shove, I'd rather get my ol' standby in the Pineapple Bun with BBQ Pork. Thanks for bringing the goods that night! As you mentioned in the Michi's post, if it wasn't because they reheated them, most likely we would have hated their buns. Trisha, hey, I liked the Banana Walnut. But yah, just not great enough for me to crave it.